Hanoi (VNA) – Meetings between the ASEAN foreign ministers and their counterparts from the bloc’s dialogue partners of Canada, the Republic of Korea and New Zealand took place in Manila, the Philippines, on August 6 morning, as part of the ongoing 50th ASEAN Foreign Ministers’ Meeting and related meetings. 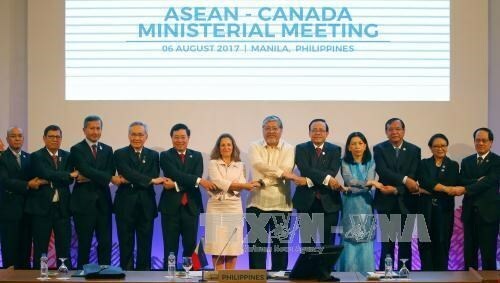 At the ASEAN - Canada meeting, Canadian Foreign Minister Chrystia Freeland pledged that her country is willing to support the process of driving back extremism in the region. Meanwhile, at the meeting with their ASEAN counterparts, the foreign ministers from the Republic of Korea (RoK) and New Zealand, affirmed the role of the bloc in the region and expressed wishes to step up bilateral ties. RoK Foreign Minister Kang Kyung-Wha asserted that the RoK government always sees ASEAN a key partner in its strategy to expand external relations. New Zealand’s Foreign Minister Gerry Brownlee said with the 50-year history, ASEAN’s political and economic role has increasingly been affirmed.